Since 1999 BeeVital specialised in honeybee-health, in comprehensive solutions for strong and healthy honeybees. We focus on solutions for organic beekeeping, not influencing the honey, effective for their purpose, using natural ingredients, ready-to-use and easy-to-use, no resistance build-up, and safe for bees, beekeeper and environment. Only strong bee colonies have the vigor and power to collect nectar and produce significant amounts of good quality honey. Therefore our goal is to provide our customers with an exceptional product, which helps them to build up and maintain strong colonies. and to stay strong and healthy ! Bee-colonies are nowadays increasingly under pressure by the 3 Ps: Parasites / Pathogens, Poor Nutrition and Pesticides. We cannot change the environment and we cannot eradicate the diseases, but the least we can do is to support our bees to better cope with these stress factors. A strong colony contains healthy and strong bees. What makes a colony strong ? This is a consequence of three major factors: POPULATION, NUTRITION and HEALTH. POPULATON: good health & quality food results in high number of active & strong bees. NUTRITION: bees need high-quality food especially in autumn and early spring. HEALTH: the hive hygiene must be maintained and healthy larvae must be reared. - Natural source, high quality concentrated beefeed. - Ideal aminoacid balance almost like the bees' Royal Jelly. - High quality nutritional effect - stronger colonies, more honey - more money. - Non-toxic – harmless for bees, beekeeper and nature. - Application in feed – sugar syrup, pollen patties or sugar dough, simply include in autumn for wintering or early spring for a good season protection. BeeStrong® is easy to use. It does not require any complicated techniques or protection measures. 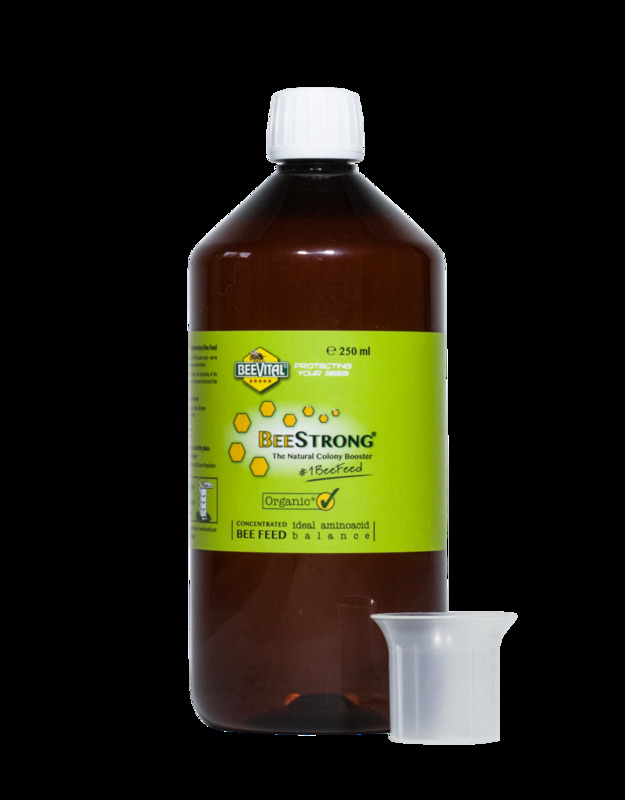 Simply put BeeStrong® into the feeding sugar syrup and mix before feeding it to the bees. Please contact your local BeeVital partner for prices and more information about the availability of BeeVital BeeStrong in your country. Product for intervention on the bee colony. All the interventions performed by the beekeeper in the bee colony for organizing the brood nest, biological balancing of the colony, merging colonies or requeening are operations that require care because all these may trigger the defense instinct of the bees and their aggressiveness may hinder the beekeeper in performing his task. Requeening, one of the important actions for bee colony, usually done every year by the professional beekeeper may sometimes be unsuccessful, especially in cases of uncontrollable bee aggressiveness. Most of the time the beekeepers use smoke in order to influence the behaviour of the bees and make the intervention possible. Smoke triggers the survival instinct in the colony; the bees load their honey stomach with honey in the eventuality of fast leaving the hive. In these stress conditions, they are less aggressive to the beekeeper as they are more concerned to carrying the honey reserves out of the endangered area. The use of BeeVital® QueenAccept does not imply any threatening perception; the bees continue their normal activity and the beekeeper may intervene in conditions that are more comfortable. BeeVital® QueenAccept is a concoction of natural compounds, frequently met by the bees in nature and even in the hive so that even when dribbled onto the bees it does not produce any panic reaction of the bees. The application is simple; just open the hive and dribble 10 ml of BeeVital® QueenAccept onto the central gaps. The most specific such intervention is requeening for which the use of QueenAccept increases the acceptance rate of the queen. However, there are several causes that may trigger the state of alarm and the aggressiveness of the bees during any intervention; the beekeeper should take into consideration ensuring normal conditions of working with bees when using BeeVital® QueenAccept. 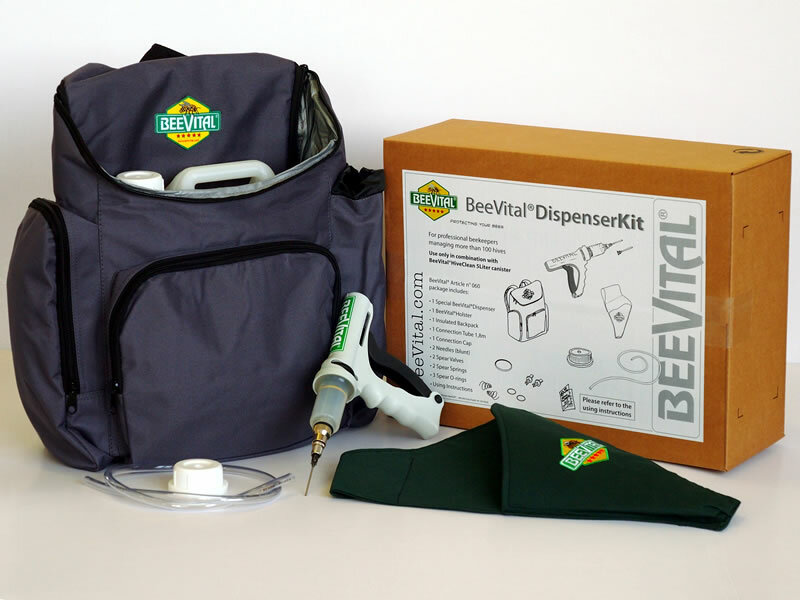 The Special Dispenser Kit is designed for use with the BeeVital® HiveClean 5 liter canister. The set contains a thermo insulated rucksack for the 5 liter canister, a dispenser and a holster, as well as all needed spare parts. It is easy to use and very practical especially for a large number of hives. The most comfortable way to use the BeeVital® HiveClean 5 Liter canister. 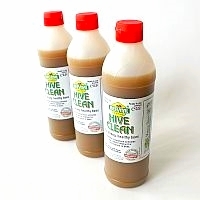 Click here to learn more about BeeVital® HiveClean. We offer a large collection of beekeeping outfits, including overalls, trousers, beekeeper jackets, gloves, hats and different kind of veils as well as special outfit combinations. Click here to download the BeeVital Outfit Catalogue. BeeVital presents the constructive solution of a hive known under the name Dadant Blatt Italica Carlini. It is the type used mainly in Italy but also adopted by beekeepers from several other countries. The bottom board is of the screened type with a metallic tray under it. The brood box is of 10 Dadant frames kind. The walls of the box are 25 mm thick; the frames rests are equipped with castellated metal parts creating the right space between frames. The supers are also equipped with metallic castellated rests for nine frames. The inner cover has such a construction that permits easy feeding of the bees, avoiding the risk of robbery, too. The outer cover is completely covered with zinc coated steel sheet in such a way that rainwater does never touch the wooden parts. Learn more about the BeeVital Bio Hive in the pdf document below. The BeeVital pollen trap may be used with almost any kind of bee hive. 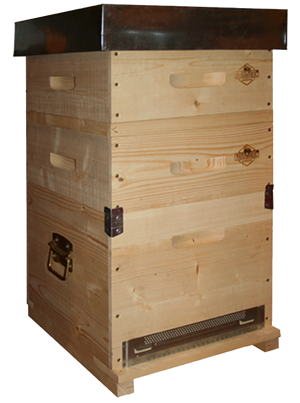 Its dimensions fit on any kind of classical hive entrance and its connection to the hive is very simple requiring a hook installed on the front wall of the brood box. The bees enter the hive by walking on a metallic mesh that connects the pollen trap to the landing board of the hive. The active plate is made out of high density polystyrene and covers the whole width of the hive entrance having 5 holes in vertical disposal. The size of a pollen trap is 380mm length x 280mm width x 170mm depth. Learn more about the BeeVital Pollen trap in the pdf document below. Only available in selectrive countries outside the EU. BeeVital® HiveClean activates the purification of bee colonies. Honeybees will be regenerated by natural means and will produce good quality honey. 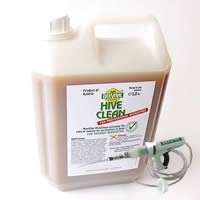 HiveClean activates the natural cleaning instinct of the bees and keeps them strong and in proper condition. Action is entirely exterior to the bee body and does not influence the quality of honey. Use preferably when the outside temperature is between minus 1 and plus 25 degrees Celsius. The best time to use BeeVital HiveClean is in the late afternoon when most of the bees are in the hive. The use of BeeVital® HiveClean results in microscopic droplets to adhere to the fine hair of the bees. Through social contact and the natural instinct of purification, the product is distributed evenly to all other bees and ensures, that the cells containing dead larvae are thoroughly cleaned by the activated bees. These larvae and all other foreign objects as well as dirt particles are consequently removed from the bee hive. When used properly the product does not negatively affect bees, brood or queen. 500 ml bottle, the classic packaging. * BeeVital HiveClean is suitable for organic beekeeping in compliance with EU Council Regulation (EEC) 834/2007. Please contact your local BeeVital partner for prices and more information about the availability of BeeVital HiveClean in your country.